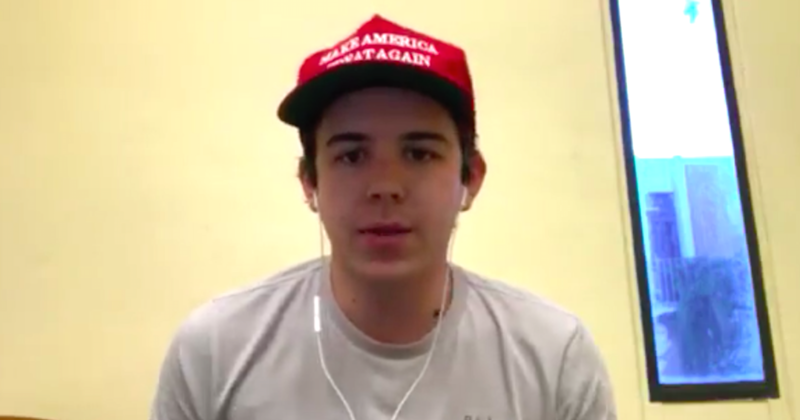 A Trump-supporting student who had his hat stolen by a classmate has spoken out. 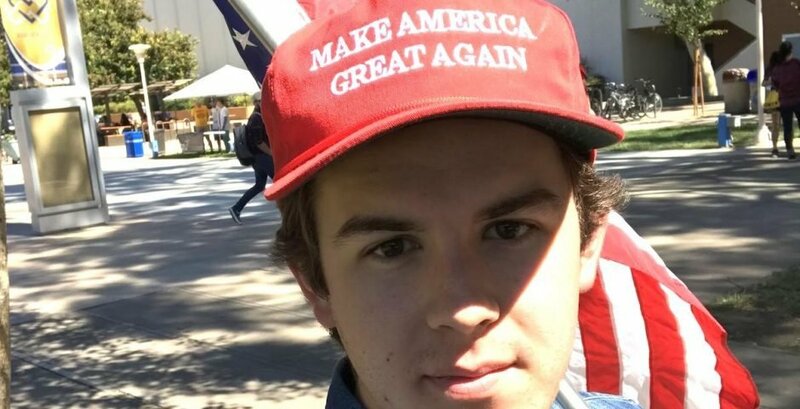 Matthew Lawrence Vitale, a student at UC Riverside was wearing his Make America Great Again cap at a seminar when a student swiped it off his head and bolted out the door. He chased after the girl, later identified as Edith Macias, and after getting it back posted a video online to say "it's not right." Context: watch the video of the student taking Matthew's hat here. Which brings us to Matthew's video, which he uploaded after the incident. "When I was about to go back to my seat, this random girl – I've never met her or seen her in my life, I have no idea who she is – came and literally took my hat off head and started running away, literally started running out of the room. At this point I was shocked, I had no idea what was happening, so I chased after her. I was running after her saying 'hey, give me my hat back, that's mine.' It's what you try to do if something's getting stolen from you, even though it is just a hat, it is mine. It's my property, I paid for it. So I was trying to get it back, I ended up catching up to her. It's not right, that's not how this works." "I didn't press charges because I got the hat back – that's all I wanted, the hat and the right to be able to wear it… Stay on your toes." We have now heard back from Matthew, who told us he's pressing charges against the student who took his hat. He added that he longer feels safe to wear his hat alone, and will only do so when he's with the rest of the College Republicans. "I was made aware that this is actually a felony so I decided to press charges when UCPD came to me with that information. There are too many people in my generation that think the way she does, that feelings supersede the law. That message needs to be sent, that you can't do that in this country. "They need to be informed this kind of behavior is not tolerable in this country. It doesn't matter what you think about somebody's clothes or somebody's ideas, you don't get to shut them up. It doesn't matter how morally repugnant, how offensive, how terrible, how objectively wrong they might be. All it matters is that it's their personal opinion and they get to have that in this country. "There have been a few messages here and there saying, 'Oh, you're the next school shooter' and 'Oh, you're a fag.' But it's been significantly more positive than negative." Felony theft in California can come with a prison sentence. Would he really – actually – like to see a student jailed for something so minor as swiping a hat? "I don't know about that, honestly," Matthew said. "I'm going to leave it in the hands of the justice system. I don't think it's for me to say. But you don't get to take people's things, you don't get to step on people's rights." And would he like people to stop stealing his Trump hat? "The message would be respect freedom of speech," he explained. "Whether it's in the form of not taking someone's property or engaging in a well-reasoned, calm debate instead of screaming in somebody's face.